Welcome to Day 87 of 100 Days of Disney here on The Purple Pumpkin Blog! Be sure to check out all of the other posts in this series, and if you would like to share your own Disney blog posts or pictures, make sure you check out our #100DaysOfDisney Link Party! 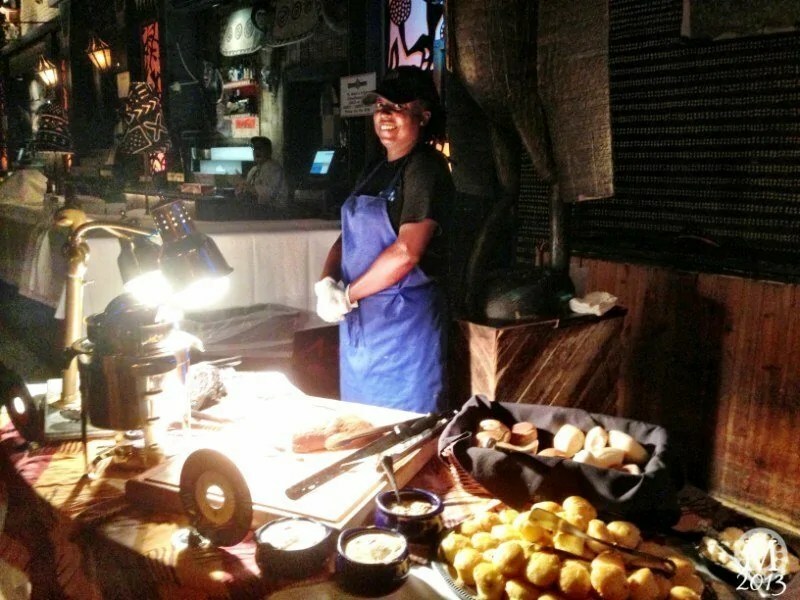 I wrote yesterday about dining in Downtown Disney, and today I’m going to tell you a little bit more about one of those dining experiences we had on our Back To The Magic 2013 trip – Sunday Gospel Brunch at House of Blues. 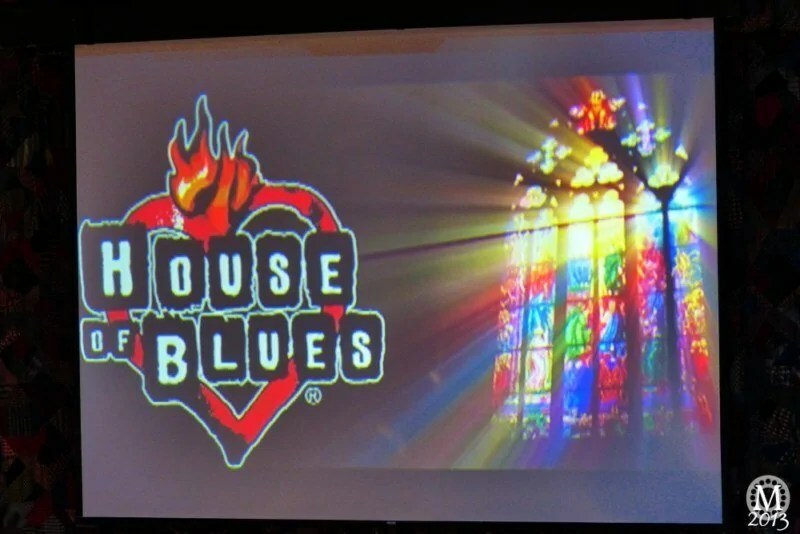 The Sunday Gospel Brunch is a ticketed event, which you must purchase through the House of Blues website, rather than through the normal Advance Dining Reservation channel as you would normally book a Disney restaurant. 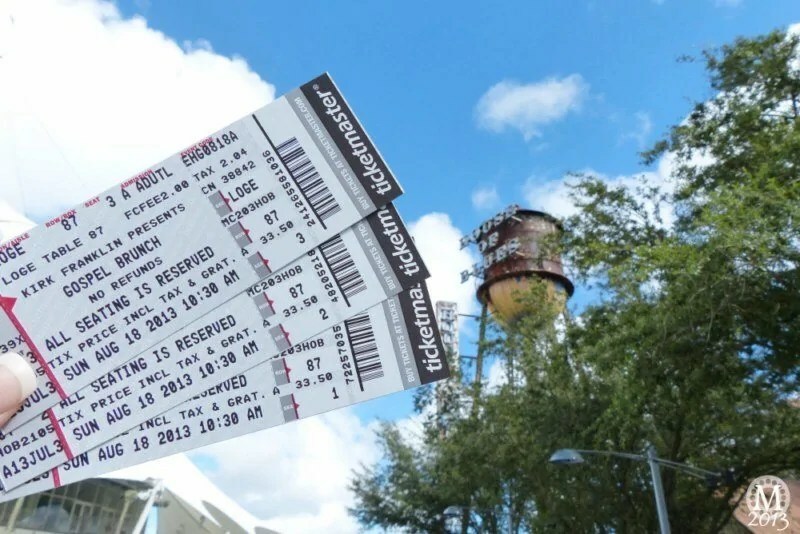 You can see from our tickets above, we paid $33.50 each for them, which we picked up from outside the venue. Whilst waiting to go inside (there are two shows, 10:30am and 1:30pm), we were entertained by a trio of singers. The seating inside consists of an upper balcony with pew like seats – we were directly opposite the stage, giving us a fab view. There is also lots of seating on round tables on the floor in front of the stage – perfect for getting up to sing along, clap and dance…even get pulled up on stage! When we went to see the show, Kirk Franklin was performing. I’m told by our American friends that he’s kind of a big deal when it comes to gospel music. The show is now called the Kirk Franklin Gospel Brunch. Kirk Franklin helped create and produce the inspiration for our new Gospel Brunch performances including the selection of the weekly gospel groups. 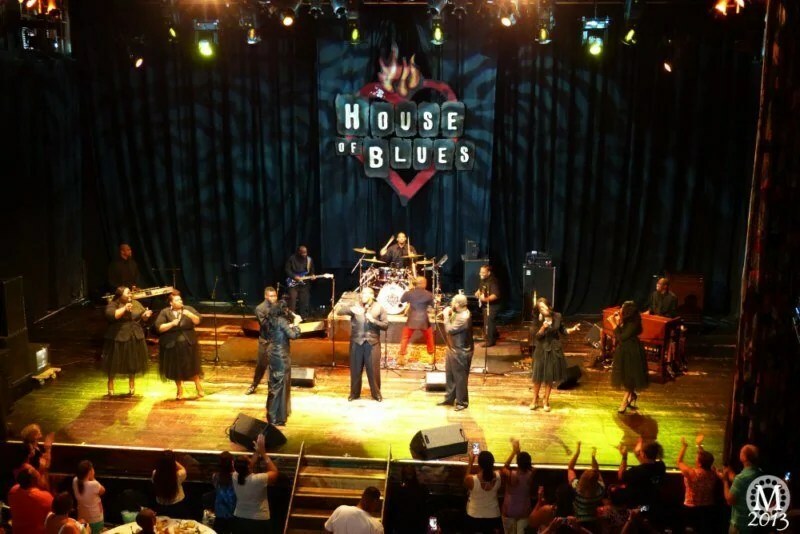 Although he does make special appearances throughout the year at many of the House of Blues venues, he does not perform at most weekly Gospel Brunch events. So it looks like we were really lucky to have him there! He was fantastic and had a real charisma about him! He (along with all the other performers) had an amazing voice and was truly inspirational. I am not overly religious, but I found the whole show to be very uplifting. Such a fab way to start the day! There is time to grab some brunch before, during and after the show – although by the end, you’re well and truly stuffed full! Soft drinks, tea and coffee are included in the buffet price. Alcoholic drinks are extra. There is a carving station with biscuits and gravy (one of my personal faves! 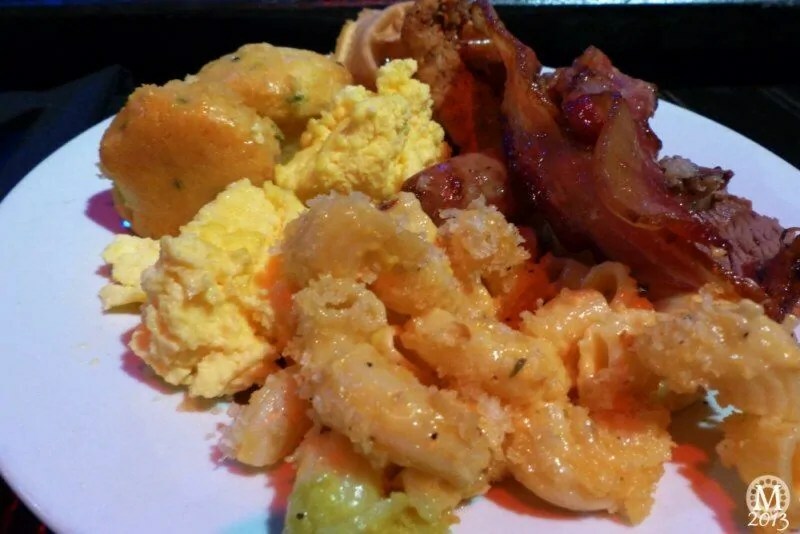 ), usual breakfast foods like eggs, bacon, sausages, plus southern favourites like mac ‘n’ cheese, fried chicken and waffles and jambalaya. 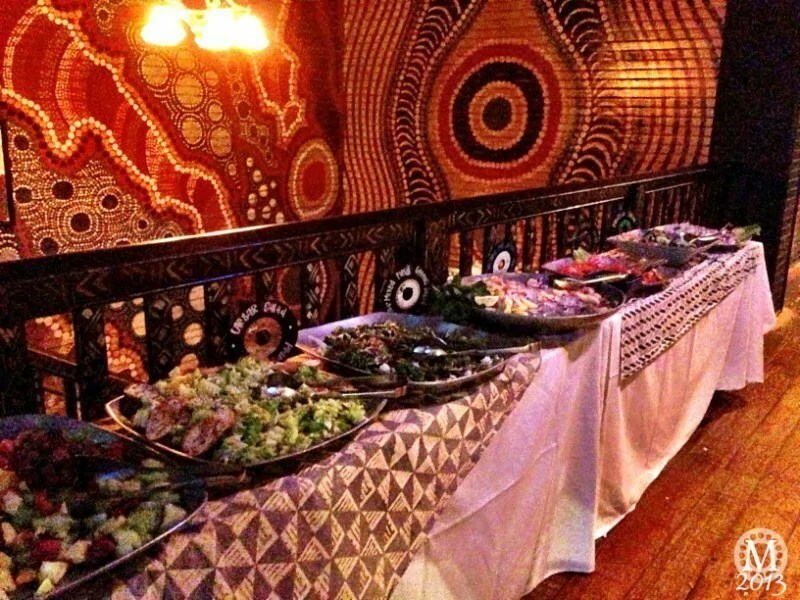 There are also salads, shrimp and fruit. The menu may change seasonally, and you are given a menu of items as you walk in. And if that all wasn’t enough, there are desserts like muffins, bread pudding and cookies! We had a toe-tapping, hand-clapping, song singing, great time. There was audience participation from the tables in front of the stage, and a lot of people were up dancing and clapping along. We all joined in with ‘Lean on Me’ at the end of the show. My friends pointed out that this wasn’t true Gospel singing, which I figured – it was more of a pop concert than I was expecting, but despite that, the music and singing was amazing (and loud!) and the food was very good. After the show, we hung out with our friends for a little while before they had to make a 4 hour drive home. There is an amazing art gallery/gift shop next door which is well worth having a look around. I thought it was fascinating, and they sell some quirky things as well as some unique artwork. Must get a Juju Guardian this year, if they still sell them!! Looking back at my trip report for this day, I see (and still remember!) really enjoying it, but as it’s quite an expensive event, it’s a real treat. However, looking back, nearly a year later, I would love to do this again in the future! 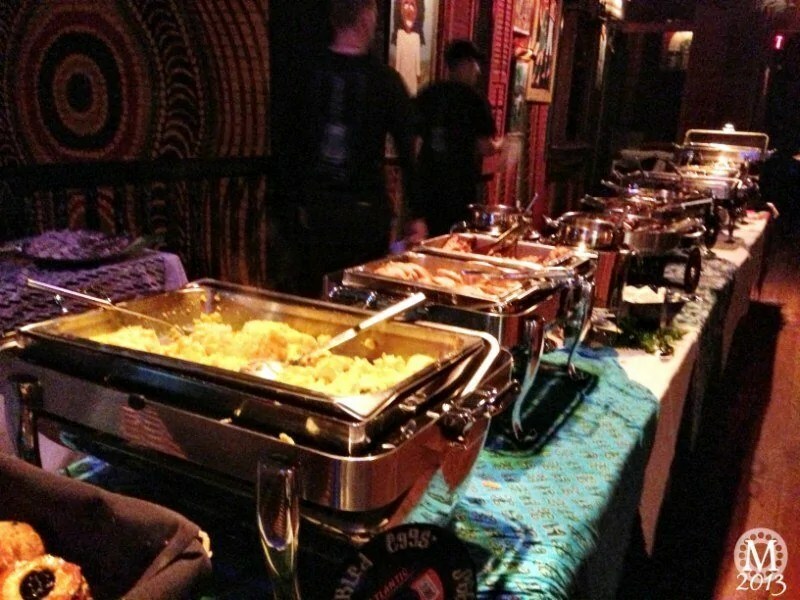 Have you been to the Sunday Gospel Brunch? Day 87 of #100DaysOfDisney is done – 13 to go!